PCWin Note: Phone Card Organizer Mate 2.1 download version indexed from servers all over the world. There are inherent dangers in the use of any software available for download on the Internet. PCWin free download center makes no representations as to the content of Phone Card Organizer Mate version/build 2.1 is accurate, complete, virus free or do not infringe the rights of any third party. PCWin has not developed this software Phone Card Organizer Mate and in no way responsible for the use of the software and any damage done to your systems. You are solely responsible for adequate protection and backup of the data and equipment used in connection with using software Phone Card Organizer Mate. Phone Number Tracer - Find out the geographical location of any US or Canada phone number. Just type in any phone number and we'll tell you which city, state, and country the phone is located in. We'll also give all the possible zip codes that are located in the area. Files Phone Number Extractor - Files Phone Number Extractor is an exceptional number extracting tool adept at extracting numbers from Word, Excel, PowerPoint or PDF files and saving them with ease. 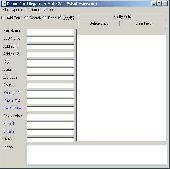 It is a fast and reliable tool compatible with different Windows platforms. eBooksWriter PRO - Create your ebook with a professional all-in-one tool, not just a compiler! Self install EXE ebooks with one click. Copy protection; password(s) for different pages/users. Full text/keyword search. Audio, video, multimedia, frames, popup: all visual. Help Writer - This program quickly creates the HTML Help files that are standard for the Windows platform. All you need to do is title the content for the Table of Contents, add any keywords, and write the body of the topic.
! !The Popup Blocker Wizard!! - Automatically clicks "Skip" link or click NO to question Make this my Home Page. clicks NO to the question Security Warnings. Multiple File Find Replace Buddy - Multiple File Find Replace Buddy 2.1 will scan specified files for specified text and replace is it with new text. Up to 20000 Find and Replace values can be stored. Web Page Change Monitor - Web Site Change Monitor 2.1 is a application that will monitor any web site and notify you when it changes. Post it Note Genie - Post it Note Software lets you write notes and post them to you computer monitor, the notes are automatically saved as you type them.